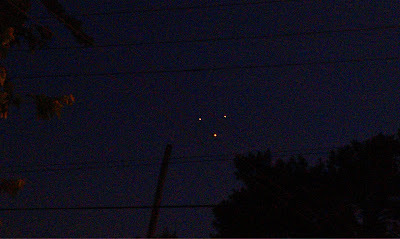 I took this photo at the corner of Riverside Dr. and Eastland Ave. in Nashville, TN at 2144 CST on 5 June 2011. There was a large triangular form with lights at each point. It appear to be massive, over a football field in size. It also appeared to be over the river or close to it. It gained altitude while rotating clockwise and the "faded out" while heading NW. The rear lights faded before the front one. 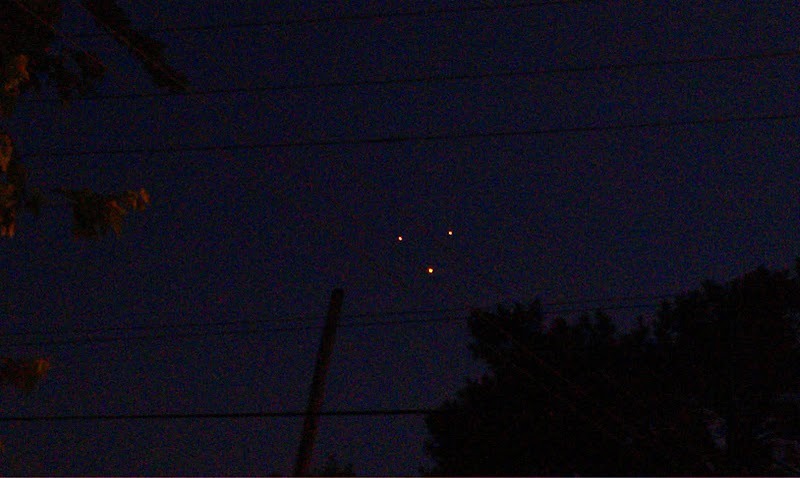 It looks like chinese lanterns again!! There is no form between the lights to suggest they are part of a solid mass! Also, the right and left sides are the same length, while the top side is slightly longer. It therefore still symmetrical though. in the time of the internet i believe NOTHING. and PHOTOS? come on!!!!!! i must see these things with MY EYES. Looks Photoshopped... lights are more distinct and cleaner than surrounding image matter. I'd call it a fake and not even a good one at that. Zoom in 1000% and you will clearly see the lights/LEDS are attached to a vine or twiggy plant . The glow from the lights are IN FRONT of the plant and the reflection illuminating the plant proves it . May even be three laser pointers trained onto the plant . FAKE ! Further to my last post , click the 400% zoom after clicking on the photo and you can VERY clearly see the 3 Laser pointer beams comming from the lower right of the screen . What do these Geeks get out of this ? Uhm, no. This isn't lasers projected on to a plant, & i don't see ANY of the things you're describing. In fact your attempt @ debunking this's so far off, It makes me wonder if you're even looking @ the right picture. You didn't bother to zoom in did you ? I'm sorry, but if you really looked at this picc for more than 2 seconds you'll see that the 3 lines are not laser pointers, but are wires crossing over the other wires. They don't even match up like a pointer would. Honestly, some people. Not saying it is or isn't a UFO, could be anything tbh, but it isn't a trio of laser pointers, let's clear that up. Zooming in clears that up as well thank you very much. Why do people insist on writing silly comments like that?